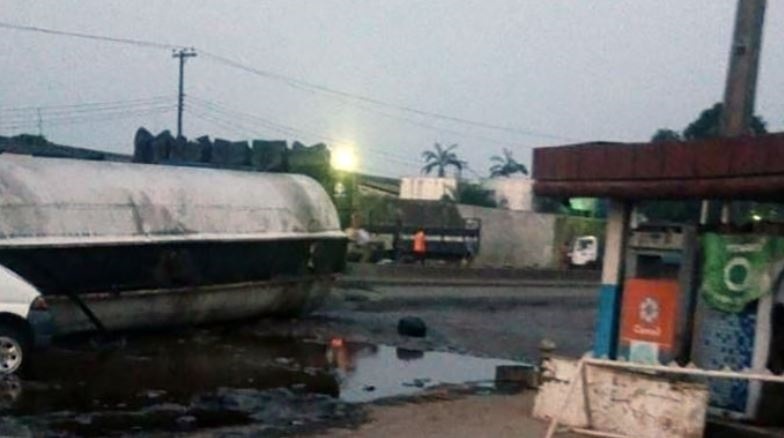 Barely two weeks after a tanker loaded with 33,000 litres of Premium Motor Spirit popularly known as petrol fell at Owode-Iyana Ilogbo axis along Lagos-Abeokuta Expressway, another tanker also loaded with the same litres of petrol fell on the road early this morning at Singer Area, Sango-Ota. The tanker travelling outside Sango-Ota fell at a failed section of the road and crushed a white Hyundai delivery van, which was by its side. The content of the tanker spilled on the road and drainage channels around the area, forcing vehicles to be diverted to the opposite lane, which led to a gridlock. The ill-fated tanker fell at a section directly in front of a Conoil filling station. But the timely arrival of security and traffic agencies to the scene save what would been a disaster, as okada riders and street urchins had besieged the scene with various sizes of kegs and other containers, ready to scoop petrol. But policemen, personnel of the Nigeria Security and Civil Defence Corps, Ogun State Traffic Compliance and Enforcement Corps and the Federal Road Safety Corps, were on ground and they kept the intruders at bay. The Public Relations Officer of TRACE, Babatunde Akinbiyi, said that the incident occurred between 5.30am and 6am.